고려시대 복숭아 모양을 본떠서 만든 상형청자의 일종으로 크기는 높이 8.6㎝, 폭 9.6㎝×7.1㎝이다. 잘 익은 복숭아를 보는 듯하며 몸통에 잎이 붙은 복숭아 나뭇가지를 뒤쪽에 붙이고, 앞쪽에는 나뭇잎 2개를 둥글게 맞붙여 잎으로 만들었다. 몸통 뒷면 가운데에 기다란 홈을 내어 복숭아의 질감을 생생하게 살렸고 잎맥은 가는 음각선으로 처리하였다. 자연스럽고 사실적인 수법으로 단순한 모양의 복숭아를 실물과 똑같이 만들면서, 잎과 나뭇가지를 이용하여 연적으로 사용할 수 있게 창의력을 살린 솜씨가 뛰어나다. 유색은 미세한 기포가 많은 아름다운 비취색으로, 복숭아 형태를 따라 자연스럽게 얇거나 두껍게 발라져 있어 더욱 생동감을 준다. 고려시대 청자연적 가운데 유일하게 전해오는 복숭아 모양의 연적으로 모양도 우수할 뿐아니라, 조선 후기에 성행한 백자도형 연적의 전신이 되는 셈이어서 더욱 흥미로운 작품이다. Made in the shape of a peach, this water dropper measures 8.6 cm high, 9.6 cm wide, and 7.1 cm long. It looks just like a well-ripened peach with branch and leaves attached to its back. Two leaves are rounded together and placed in the front part of the water dropper. In the middle of its back is a long groove to replicate the look of a real peach. The veins in each leaf are engraved in thin lines. The creative artistry displayed in this water dropper is extraordinary. A real peach is recreated using the natural and graphic technique, with a practical function realized by making it into a small water dropper using the leaves and the branch. 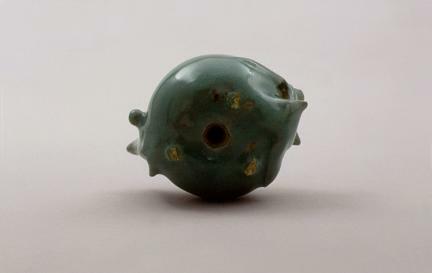 The glaze used on this celadon has a jade green color because it includes numerous tiny vacuoles. It is coated thoroughly and perfectly with the glaze as if it flowed naturally along the contour of the peach, adding greater vivacity to the body. 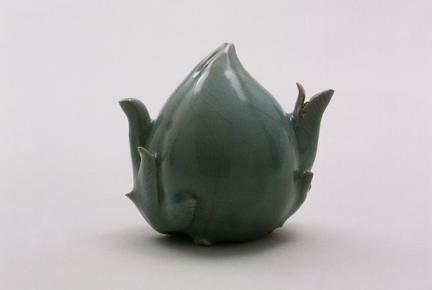 As the only remaining celadon peach-shaped water dropper dating back to the Goryeo Dynasty, it is an interesting piece of art not only because it has a magnificent shape but also because it is a prototype for peach-shaped white porcelain water droppers, which became popular in the late Joseon Period.